A coworker passed along a blog post with an anecdote about the oft forgotten danger in placing a market order trade. Although the story is nearly a year old, it seems that this is a lesson worth repeating: the price on the quote does not necessarily mean that is the price that will get filled. 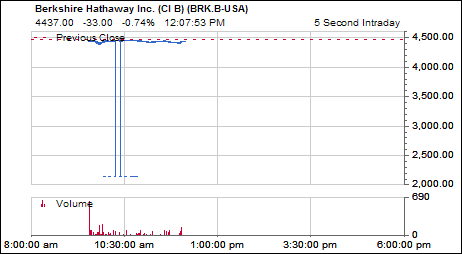 The incident occurred when someone tried to sell some shares of Berkshire Hathaway’s B-shares (BRKB), and the quoted price on them at that time was $4,448 per share. Instead when the order was filled the price per share was a shocking 52% lower or $2,147 per share. You can read the original post about it here. We have republished the chart from the original blog post. If you think the market is too efficient to allow for arbitrate this case seems to suggest differently, and this is not just some no name penny stock. The trader who bought these shares made more than $100,000 at the expense of average Joe’s. Protect yourself against this sort of anomaly by using limit orders, especially on thinly traded stocks.